Hi everyone. 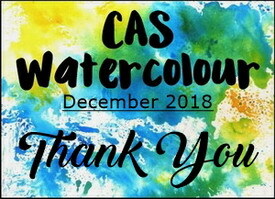 A reminder for the CAS Watercolour December Challenge - Thank You is only running for two weeks this month. There's just one more week to play along before it closes. I'm sharing the twelve thank you cards I sent to my wonderful Guest Designers of my Christmas Tag event. They were fun and easy to make. I started by making six large backgrounds using stencil monoprint technique with Brushos. Once the backgrounds were dry, I cut them in two equal pieces, creating my twelve card fronts. I pulled out several silhouette stamps and started stamping the card fronts with Black ink. I used white embossing on black card stock for the banner sentiments. The front card panels were popped up on foam to add a bit of dimension over the card base which had been splattered with diluted black acrylic paint. Above are two cards made from the same background. Below are the remaining 10 cards, again grouped in twos with each set using one background cut in half. Hope you like them! WOW! Don't think I ever did 12 cards that fast but love the look of these. Your backgrounds are superb and perfect for a silhouette. Love the splatter on the card base too. What a gorgeous batch of cards!! I love them all - great colour combinations of brushos, great silhouette images! All cards are amazing! I love both those that have intense background colors and those that are delicate. A great set of cards for friends. And I'm sure that every friend of yours also wants to thank you for your wonderful friendship and big heart. These are all fabulous ..... I loved mine! Oh my, what an array of fabulous and artsy stencil monoprint cards! Gorgeous effects and colors for all of them. Even though you used the black silhouette, the black spatters, and the striking b/w sentiment strip, there's still something elegant about the cards. I think that's the "Loll-ness"! Lucky helpers! These cards are gorgeous, Loll. The backgrounds are so beautiful and the images just pop! Wow!! Even prettier in person if that it possible! I've sure been enjoying mine! Thanks, sweet and talented friend. Thanks for this lovely post! All 12 are absolutely BEAUTIFUL and I'm glad you shared this post...wonderful to see them all lined up together!! LOVE these mf....all so wonderfully done!! wow. These are lovely and what a great idea to cut the background and make two cards at once. I love the backgrounds on every one and the beautiful silhouettes. I so loved mine....The thistle was a great nod to Scotland, where I live x The colours are so pretty and I love the technique. You are amazing! These all look so good. Your backgrounds are beautiful! Simple beautiful cas cards Loll. Love the amazing variety you produced and off course there is a 'thistle'. Couldn't NOT see that one. Lucky Mac! Gorgeous set of cards, Loll!